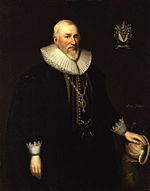 Sir Hugh Myddelton by Cornelis Janssens van Ceulen (1628). The play contains a possible allusion to Myddleton's 1608 scheme to bring clean water to London. First official record: mentioned in the Stationers' Register entry for the First Folio, on 8 November 1623. First published: First Folio (1623), as The Tragedy of Coriolanus. First recorded performance: the earliest known production of the play was a 1681 adaptation by Nahum Tate performed at Drury Lane. Called The Ingratitude of a Commonwealth; or, The Fall of Coriolanus, the play was specifically written to protest the anti-Catholic riots which arose in response to the "Popish Plot" to assassinate Charles II. In 1719, John Dennis adapted the play, again into a political protest piece staged at Drury Lane. The Invader of his Country; or, The Fatal Resentment was written in response to the Jacobite rising of 1715. More adaptations followed; James Thomson's 1747 version Coriolanus: A Tragedy was performed at Covent Garden in protest against the Jacobite rising of 1745, and Thomas Sheridan's Coriolanus: The Roman Matron, which combined Shakespeare's original with Thomson's version and was performed at Smock Alley in Dublin in 1752. The earliest known production of the straight Shakespearean text was on 11 November 1754, when David Garrick staged an abridged production at Drury Lane. Evidence: the play must have been written between 1605 and 1609. A terminus post quem of 1605 is fixed by Menenius' speech regarding the body politic (1.1.93-152), which is partly derived from a speech attributed to Pope Adrian IV in William Camden's Remaines of a Greater Worke, Concerning Britaine, which was published in 1605. A terminus ante quem of 1609 can be fixed by Ben Jonson's Epicœne, or The silent woman, which mocks the line "he lurched all swords of the garland" (2.2.99), and Robert Armin's Phantasma the Italian Tailor and his Boy, which contains a close parallel to the line "they threw their caps/As they would hang them on the horns o'th'moon" (1.1.209-210). Epicœne was written in 1609, and Phantasma was entered into the Stationers Register on 6 February 1609. Topical allusions, however, can be used to narrow the date further. For example, the presentation of the grain riots is strikingly reminiscent of the Midlands corn riots of 1607. Perhaps significantly, Shakespeare was in Stratford-upon-Avon for much of autumn 1608, organising his mother's funeral and conducting business, and thus would have been close to the origin point of the unrest. The reference to "the coal of fire upon the ice" (1.1.170) is a possible allusion to the winter of 1607–08, when the frost was so severe that vendors set up booths on the frozen Thames river, and pans of coals were placed on the ice so that pedestrians could warm themselves. Also, an allusion to the complaints about Hugh Myddelton's project to bring clean water to London from the River Lea (which originated in 1608) has been detected in Martius' warning to the patricians "to say he'll turn your current in a ditch/And make your channel his" (3.1.98-9). Gary Taylor also finds the use of act divisions in the Folio text important, as the King's Men only began to use act divisions when they occupied the indoors Blackfriars Theatre in August 1608. Lee Bliss argues that the five-act structure is built into the thematic fabric of the play, further strengthening the argument that it was written for Blackfriars. Indeed, Bliss believes Coriolanus may have been the King's Men's debut play at the theatre. Taylor believes that the cumulative internal evidence all points to a composition date of no earlier than spring 1608. In his 1994 edition of the play for the Oxford Shakespeare, R.B. Parker dates the play mid-1608. In his 2000 edition for the New Cambridge Shakespeare, Lee Bliss is unconvinced by the arguments that Shakespeare is referring to the freezing of the Thames or to Myddelton's scheme, and settles on a date of late 1608 to early 1609.